The Black Diamond Vision harness weighs just nine ounces. It is among the lightest harness produced by the brand and intended for alpinists. 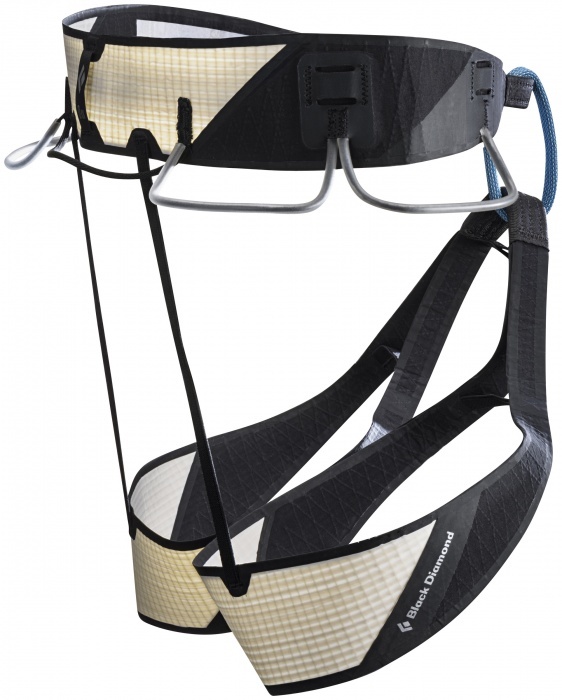 For the lightest carry weight possible on technical routes, an ultralight harness is essential. 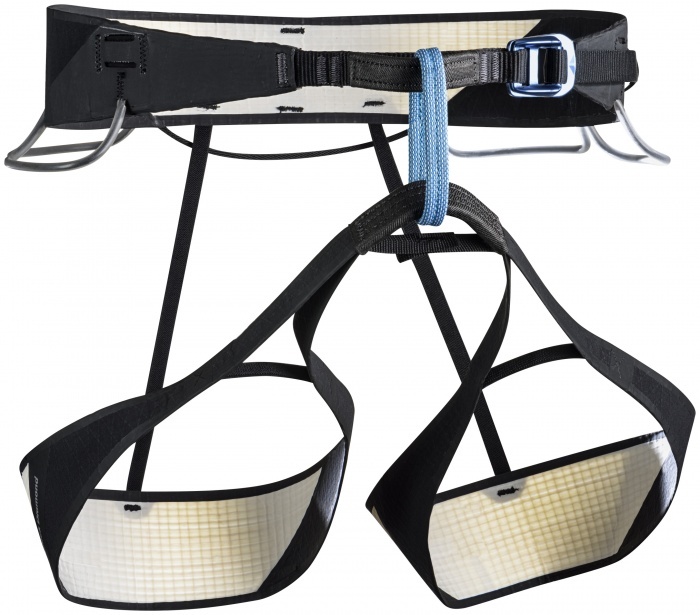 Black Diamond aimed the Vision harness ($150) at alpine climbers who value minimalism in each component of their kit. It packs small and has all the features an alpinist needs, and nothing extra. It’s comfortable for the weight class. GearJunkie received a pre-production prototype for review and tested it in true alpine conditions. 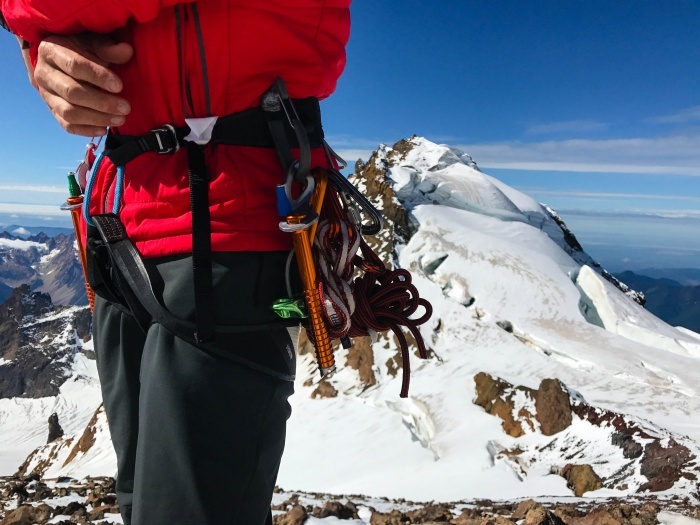 The standout feature of the Vision harness is the unique material used in the waist and leg loops and the belay loop and tie-in hardpoints. Vectran producers spin liquid crystal polymer into fibers with five times the tensile strength of steel and 10 times that of aluminum per unit mass. The material is similar to Kevlar. Vectran sailcloth forms the leg loops and waistband. It’s strong, resists abrasions and flex fatigue, and is hydrophobic. These qualities make Vectran an ideal material for alpine equipment. The downside to Vectran is it degrades in UV. Thus, a UV-resistant scrim coats the Vectran fibers in addition to two layers of polyester sheeting. Black Diamond chose ultra-high-molecular-weight polyethylene (UHMWPE) yarns for the belay loop and tie-in point reinforcements. Similar to the branded material Dyneema, UHMWPE is one of the strongest manmade fibers. Combined, these materials allow the Vision to be one of the lightest harnesses Black Diamond has ever produced. The leg loops have elastic at the risers. 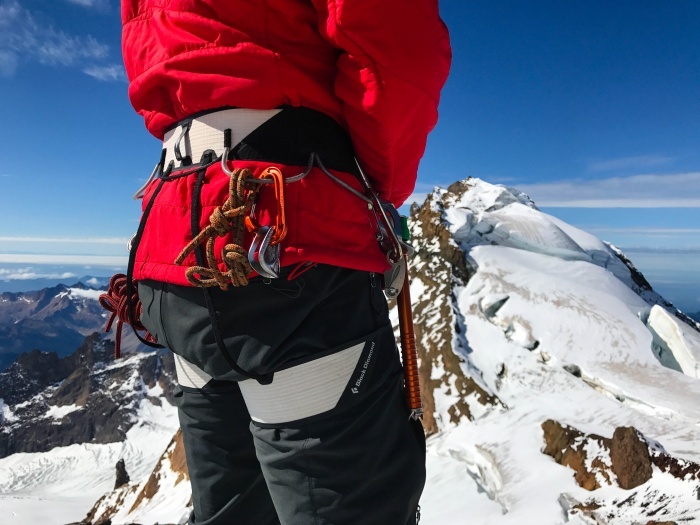 This allows climbers to wear different combinations of layers under the harness, from thin to thick, depending on the weather. Sewn patches on the waist loop’s exterior form the four ice clipper slots and facilitate attachment of the four gear loops (vinyl tubing over webbing) and rear-mounted cord gear loop. 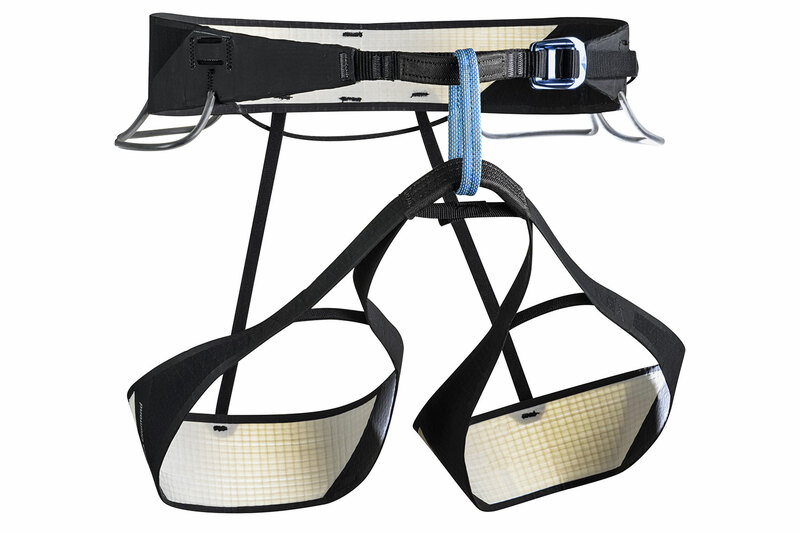 Double layers of Vectran are in areas where the harness narrows: leg loops go into the crotch, and the waist loop transitions into the webbing. The 20-mm main waist buckle is pre-threaded. We weighed the Vision. This stripped-down alpine harness tipped the scales at nine ounces for a size medium. 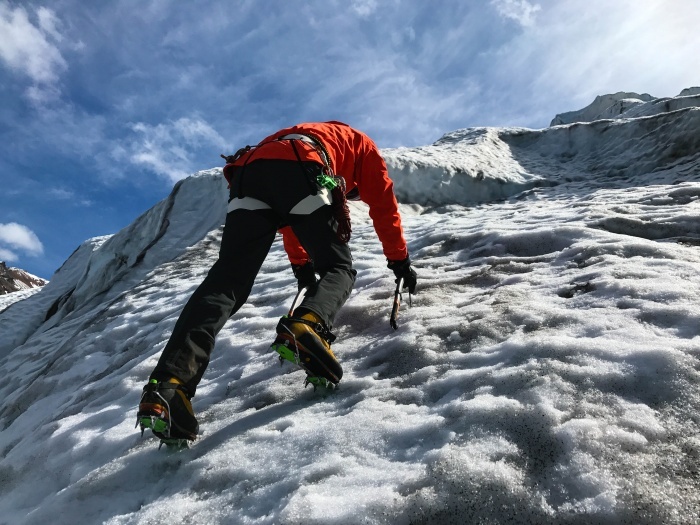 I tested the Vision harness on a late September climb of the North Ridge of Mount Baker in the North Cascades of Washington. The minimal weight was evident as I unrolled it from the tiny package at the toe of the Coleman Glacier. The elastic in the leg loops adjusted nicely around the two to three layers used during the climb. The waist loop adjustment buckle felt tiny but adjusted easily to accommodate the two to four layers necessary as conditions changed. The ice clipper attachment points were very tight; some force was required to get the clippers mounted the first time, but that firm grip proved valuable. It prevented the clippers from twisting while loaded with ice screws throughout the three-day climb. The positioning of the clipper attachments was perfect. I rarely looked down to put my hands on the ice screws. The four gear loops were in ergonomic positions; I kept often-needed carabiners, runners, and belay devices racked in the two forward loops, and cordelettes, rescue gear, and my knife mounted on the rear loops. With that, I had plenty of room. The single rear loop went unused on this outing, but it was nice to know I had the extra capacity in case I ended up with the majority of the group’s gear following an intricate pitch. I rarely noticed the harness while climbing. The light weight and fit never impeded movement or got in the way. I never noticed the the single-layer construction and lack of internal padding thanks to thick layers worn while alpine climbing. Even loading the harness at belays for longer stints was reasonably comfortable. After a single outing, the harness seems tough. It showed no visible signs of wear other than enlarged ice clipper attachment slots, wrinkling of the Vectran fabric, and a slight dulling of colors. The low weight of the Vision harness combined with minimalist but adequate features make it my first choice for technical alpine routes. Weight is the primary concern for gear decisions with such adventures, but only when functionality and durability are intact. Black Diamond hit it on the head with this harness, and the comfort is just a bonus. The Vision is out now. It retails for $150.